The program when it first started, without many materials. In recent years, the number of newcomers settling in Guelph has sharply increased, largely due to a very low unemployment rate. This fueled more requests for the services of the Upper Grand District School Board’s LINC program—the only one in the area. The associated CNC site was always running to capacity, but the waitlist grew to 75 children. It was bursting at the seams. When funding came available from Immigration, Refugees and Citizenship Canada’s initiative to support Syrian refugees, the program put forward a proposal to open a second location. The first task was to find a location to house the program. It took months to find space in a one-time school, now being used by a community group. The building included a former gym that could be converted to accommodate CNC. 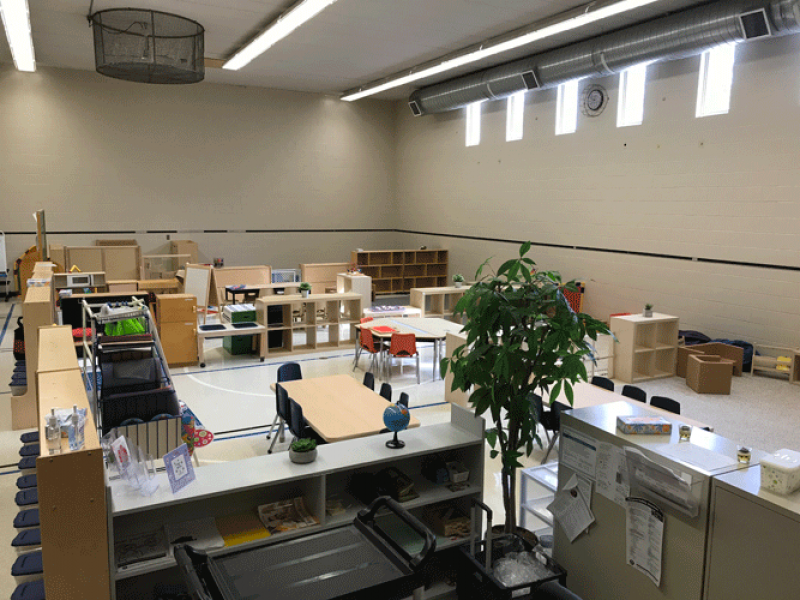 While it had desirable elements, such as a main floor location, sunlight, some plumbing, and an exit to a playground—the gym was otherwise a blank canvas. 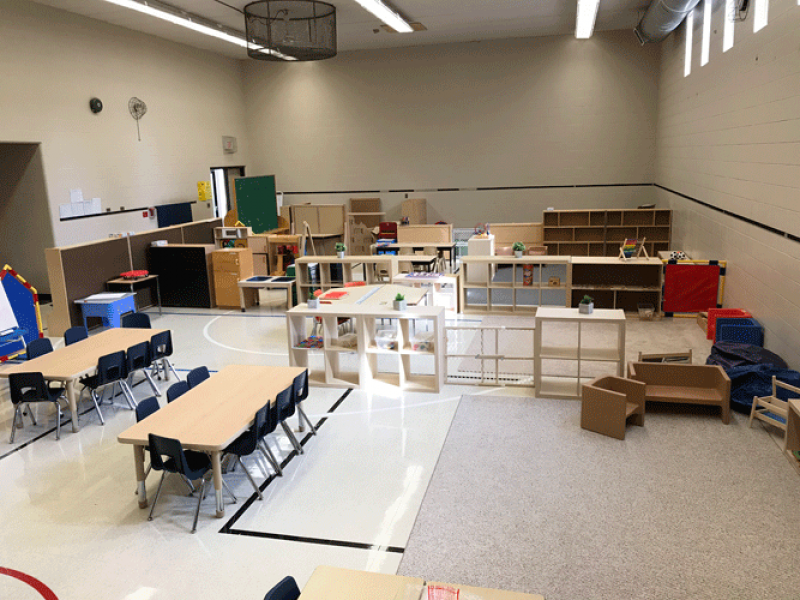 Required renovations entailed transforming locker and storage spaces into a kitchen, washroom, and handwashing station. A hurdle came early on in the process, when the school board required a building permit for the renovations. 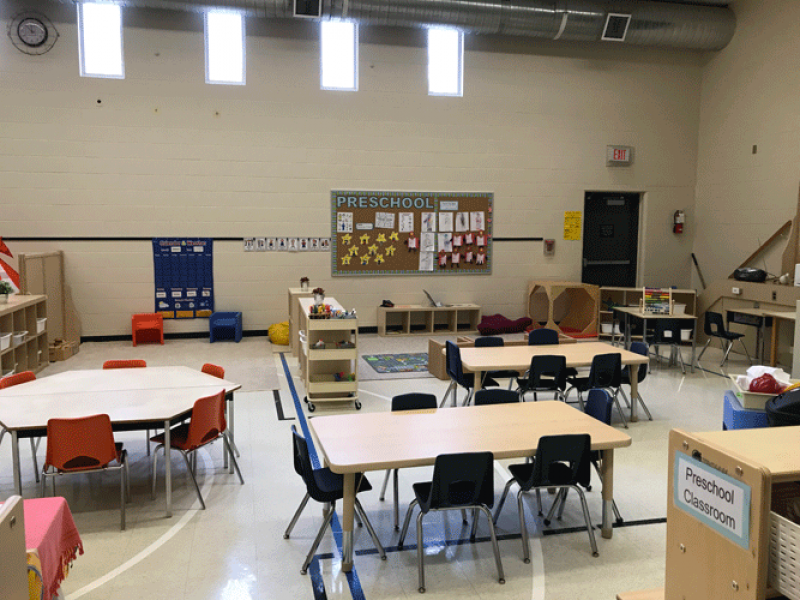 The city did not understand how the proposal for the space would comply with the Child Care Early Years Act (CCEYA), as they assumed the child care program was a licensed daycare. They needed to be pointed to legislation explaining how CNC is different in order to obtain an exemption. 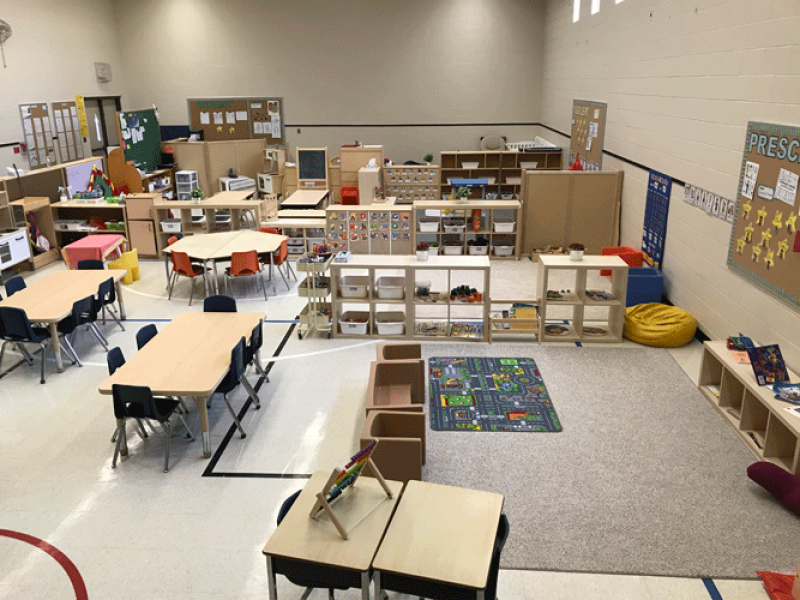 Once the renovations were complete, the next step was getting the layout, functionality and furnishings of the space just right. Given her years of experience, Sandra had a vision for how it would look and how the program would interact within it. There was the luxury of time to go back and forth with Sheila over different floorplans, allowing the vision to evolve over a few months. 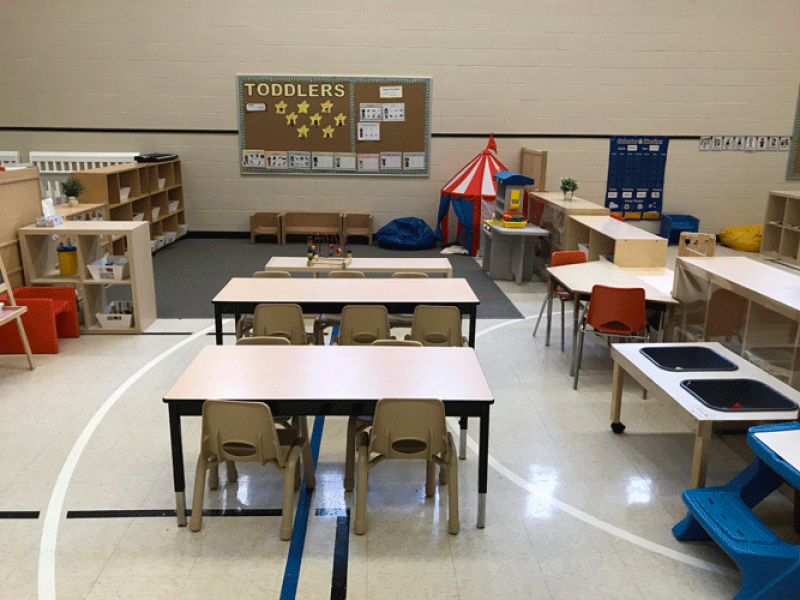 Kim also had some input into the final layout, suggesting ways to manage the openness of the space that operates infant, toddler, and preschool programs. For example, with no walls in the gym, Sandra researched gates and dividers to separate areas. Kim was able to offer advice, because she has seen how other sites dealt with similar issues. “Kim is very flexible. When we had any questions, I could just call her or text her and she was amazing,” recalls Sandra. Having CMAS see the site before it opens its doors, was also beneficial. When Kim first visited the completed space, she was blown away by how much thought was put into it. She did suggest they turn a staff desk around so allow for better supervision of the entire space. Sheila and Sandra are in agreement. “Opening a new program can be a very challenging process and every site is different—there is no one-size-fits-all. A new supervisor might have a hard time meeting all the CNC requirements. Even with our experience, we had to call Kim to ask questions about the application of the requirements in another environment,” notes Sheila. In the end, all the hard work paid off, breathing new life into what was once a gym. 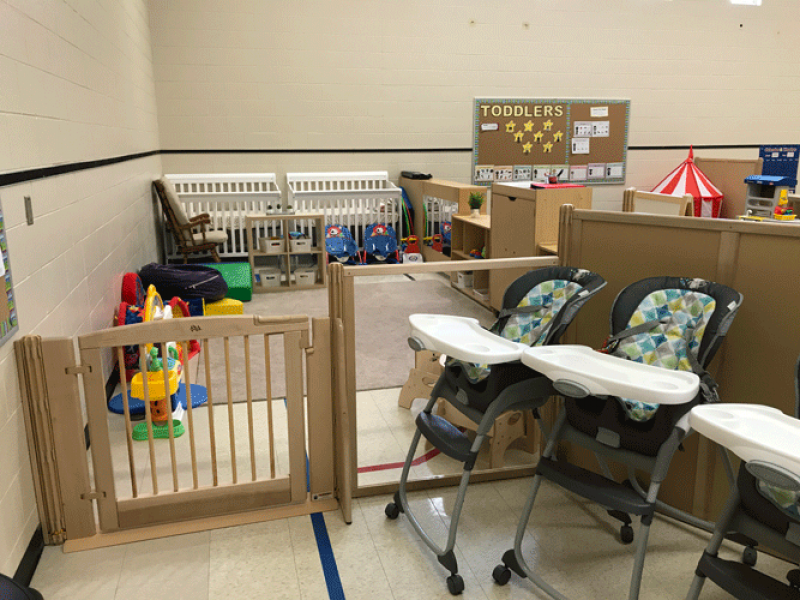 Not only do the children enjoy the space, but the staff love its functionality.